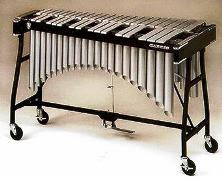 The vibraphone is a descendent of the xylophone and the marimba. It was invented in the U.S. toward the beginning of the 1900's and was introduced in the field of jazz by Lionel Hampton, who used the instrument for the first time in a jazz recording session with Louis Armstrong in 1930 as documented on Okeh 41463, Memories Of You (Eubie Blake / Andy Razaf), recorded 16 October 1930. To give you an impression of how the vibraphone is played, I found a great example featuring Marco Bianchi in a solo version of "Crazy Rhythm"
The technique of using four mallets when playing the vibraphone was reputedly first employed in jazz by another great vibe player, Adrian Rollini, who took up the instrument in the early 1930s. 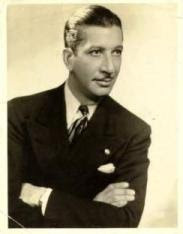 From around 1935 Rollini tended to specialise on the vibraphone and in 1936, he formed his Trio - this was the format he used in performance until the end of his life. The Trio became very successful and played long residencies at hotels in New York and Chicago. 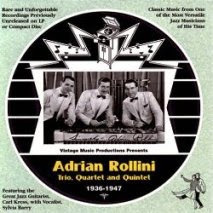 The shown cd above, released by Vintage Music (VPM 0171) in 2005, contains some of the sides by the Trio cut for Decca and Vocalion in 1936 and 1939 featuring Adrian Rollini on vibraphone (- and sometimes on chimes), Frank Victor (guitar) and Haigh Stephens or Harry Clark (sb). Further, the cd has some radio transcriptions made for World Transcription Service in 1938 featuring quintet and quartet recordings. Personnel listing has Rollini on vibes, Paul Ricci or Arthur Rollini (reeds), Al Duffy (vn), Carl Kress (g) and Haig Stephens (sb) for the quintet - the quartet features Rollini (vib), Al DUffy (vn), Frank Victor (g) and Harry Clark (sb). A couple of additional sessions from the 1940s are also featured on the cd, one of them has vocal by Sylvia Barry. Most of the material on the cd has not been reissued before and is recommended, if you like to explore this side of Adrian Rollini's genius as a musician. The repertoire of the cd is well known standards of the 1930s swing jazz (- click on cd-cover above to see tracklist). One of the tunes - first made popular by Benny Goodman's Quartet featuring Lionel Hampton on vibes - is Moonglow. Listen to the Adrian Rollini Trio playing this tune on the inserted video below. The vibraphone has been used with great success by other jazz musicians as well, i.e. Milt Jackson with Modern Jazz Quartet and Gary Burton with Thelonius Monk, however, let's not forget the roots of this fascinating instrument - the marimba. During the 1940s marimba bands were popular in the U.S. as part of a latin wave in general entertainment. I found an enjoyable example of a female marimba band headed by a certain Reg Kehoe playing Larry Clinton's "A Study In Brown" c.1940 - watch the bass player going nuts, probably the first ever recorded example of another novelty in entertainment - headbanging! I guess your wrong Jo. The bass player wants to draw attention as otherwise all those beautiful ladies distracts the audience attention too much. Thanks Jo for this great intermezzo. I have a personal spot in my heart for Adrian Rollini. My 1st Wife, Stage name Connie Howell was Adrian's only student and joined Frank Victor in his quartet playing 4 mallet Vibes in NY spots. In case this is not well known information, Dixie Rollini, Adrian's wife created the wound string mallets used by Adrain and Connie. After we Married and moved to Miami she played some of the best hotels 0n Miami Beach as a single on Piano. She also teamed up with Guitar player, Harry Volpe in Miami in the late 50s, early 60s. Those were great music years.